A sustainable culture of continuous improvement needs five things: bottom-up improvement, top-down improvement, strategy deployment, coaching, and visual management. Every organization claiming to be Lean incorporates some of these 5 elements, but only the best incorporate them all. Part of the trouble companies have is that they find themselves focusing too much on top-down initiatives such as Rapid Improvement Events, Kaizen Events, and Lean projects. Yes, these approaches are all valuable - but they’re not the end all, be all of an improvement culture. Bottom-up improvement is necessary in order to make incremental, impactful improvement by engaging every person in the organization in solving the most pressing business concerns. There are some major differences that must be accounted for when coaching bottom-up improvement as compared to top-down. In this post, we’ll take a look at what some of those differences are - and why increasing bottom-up improvement is worth making a change to your coaching style. It’s common for improvement coaches to operate in a bubble in which everyone they engage with has the words “Lean” or “Process Excellence” in their titles. In this case, the people you’re coaching on improvement already have a strong foundation in Lean methodologies and principles. It’s a pretty different scenario when you’re coaching staff in a bottom-up improvement culture. These people have no Lean training and are certainly not improvement experts. You’ll provide them some introductory training as you roll out the improvement culture, but don’t get trapped into thinking everyone needs to be an expert before they’re allowed to participate in improvement. Everyone has the ability to examine their own processes and identify ways to improve them. Don’t get bogged down by adding unnecessary complexity to the improvement process. Make it easy for people to submit their ideas for improvement, give honest and respectful feedback when those ideas are impractical or unnecessary, and coach people gradually to work through the improvement cycle in their daily work. When the only improvement initiatives taking place in an organization are large projects and events, it’s relatively easy for an individual coach (or a small team) to keep track of who is working on what, issues that are popping up, and the results obtained. When you’re coaching a bottom-up improvement culture, it’s a different story. Here you have hundreds of employees fulfilling every function in the business, spread throughout the building - or even across the country. You’ll need to utilize technology that increases visibility into the improvement work of a dispersed workforce. You can’t possibly have one-on-one check-ins like you could with small teams in rapid improvement events, but you can get the visibility to see what people are working on, when work is falling overdue, when managers aren’t keeping up with their staff, when people need coaching on thinking through improvements, and so on. It’s critical that you maintain communication with your staff, offering feedback consistently and promptly. Continuous improvement software makes it possible for you to offer this level of service to a large team in a bottom-up improvement culture without necessarily having to expand your coaching team. When you’re coaching improvement experts in Kaizen events and Lean projects, you’re pretty much running the show. It’s a controlled environment, you have access to all the data, and you have the bandwidth to coach all teams closely. When coaching a bottom-up improvement culture, though, managers play a much heavier role in guiding the culture and driving progress. For example, you can’t approve and assign every improvement in the organization; even taking bandwidth out of the equation, you don’t know enough about every process to decide whether the ideas are good ones or who should work on them. That’s where your managers come into play. You’ll need to focus a lot of effort on how to coach managers to encourage employee engagement, maintain a positive improvement culture, and ensure that progress is made via improvement toward strategic goals. To do this, it’s important to have transparency into the workflow of the managers. Are their areas getting fewer staff ideas than others? The managers need coaching to increase employee engagement in the improvement program. Are staff submitting ideas that are ignored for too long? The managers need coaching on the importance of reacting quickly to new ideas. Are managers taking on too much of the work themselves, and thus falling behind and reducing employee engagement? They need some coaching on how to empower employees to be responsible for their own ideas. With targeted coaching like this, you’ll gradually train up a team of managers that are capable of helping you drive a bottom-up improvement culture at a local level. With that extra layer of help, the culture will spread far beyond what it could have done without the help of managers. When you’re an improvement coach leading one improvement event per month, the impact you can have on the organization is limited in size and scope. If you’re a coach in a bottom-up improvement culture, the opportunity for growth and impact is really unlimited. The more people you’re able to reach through targeted coaching and manager development, the more far-reaching your impact will be. 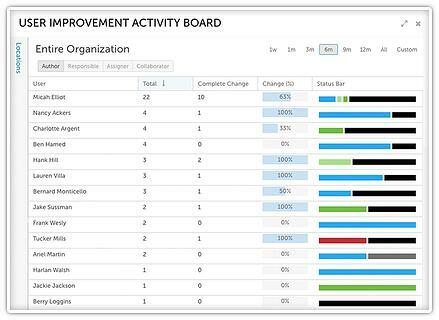 Using the engagement and activity reports in continuous improvement software makes it possible for you to continuously hone in on areas that need your help and offer encouragement to those that are doing well without you. In this way, coaching bottom-up improvement gives you the opportunity to touch more people and lead an organization-wide cultural transformation. When trying to calculate the impact of improvement, the levels of engagement, and the amount of activity in your improvement culture, you need everyone tracking this information in the same way so that you can compare apples to apples. That’s simple enough when your organization only does top-down initiatives - but nearly impossible in a bottom-up culture of improvement in which everyone uses their own language and methodology for tracking such things. That is, nearly impossible without continuous improvement software. A CI platform helps here by creating an organization standard that fits the workflows and processes unique to your own organization. It gets everyone speaking the same language and reporting the impact of improvement the same way, and then compiles reports of all KPIs for you. 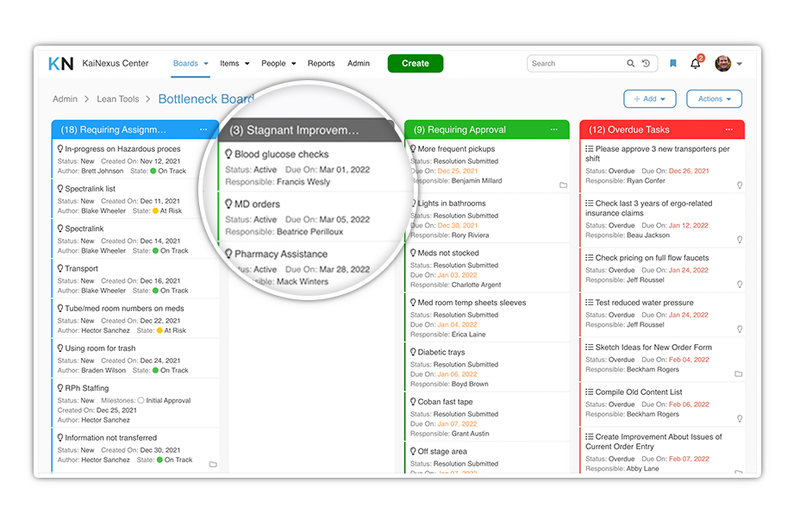 Continuous improvement software automatically generates impact, activity, and engagement reports that scale to any level of the organization so that you can look at the company as a whole or drill down into specific areas and individuals for more detail. While reporting on bottom-up improvement across an organization seems like a daunting task, it’s made possible (and simple) by the right technology. What about you? What differences have you seen between coaching in a bottom-up vs. a solely top-down improvement culture? What advice do you have for coaches expanding their programs to incorporate a bottom-up approach?